Drilling mud agitator installed on the mud tank is an important equipment, strictly speaking, once put into operation should be kept for a long time to ensure drilling fluid uniformity and centrifuge work normally. In the early 1980s, a part of mud agitator used for solids control system were imported from foreign companies, but most directly use agitators which used in chemical industry system. In the end of 1980s, most used agitators were copy from foreign agitator, the main problems of mud agitator in this period were bad reliability, poor stir effect, large power consumption, impeller blade break easily, can’t work for a long time continuously, serious oil leak. All of these problems almost were the common failing of drilling mud agitator. The impeller was single impeller, disk impeller type is in the majority, in-tank liquid was not form a good convection. Through the efforts of the domestic in recent years, China from imitation stage run to developing new structure by oneself. Long-term puzzling problems has already solved. Now, lots of excellent solids control equipment China manufacturer appeared. TangShan DC Machinery is a professional manufacturer of solids control equipment, the following is the parameters of JBQ series mud agitator produced by DC Machinery. Shaft Length Decided by the depth of the tank. Impeller Diameter Decided by the inside diameter of the tank. Remarks If the length of impeller shaft is beyond 1800mm, Centralizer set is required. 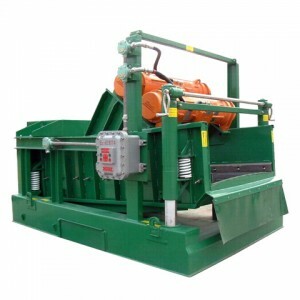 The following is the use and maintenance of shale shaker. When the drilling fluid is circulating, the shale shaker should continuous running. For enhance the service life of screen which has no tension, it must ensure every parts (like rubber strut member, nut, bolt, spring, etc.) can be installed suitably, no deformation. According the installing step which supplied by manufacturer to install the screen. If the multilayer shale shaker only uses one layer, it must ensure the tension pole is safe and reliable. In order to avoid the drilling fluid cover up the screen, the user must clean screen before every starting. Check up the operating environment of vibration isolation component and the support part of screen timely. If take place damage or over fatigue, they should be replaced timely. Upper layer screen of double-deck shale shaker use the coarse-mesh screen, under layer use the detail screen, and watch the under layer screen intact whether or not. About the shale shaker with single layer composite screen, it should use screen which has the same mesh number. If the drilling fluid flows from the hole or broken place, the drilling cuttings will not be eliminated. Any screen which has the hole or damage must be replaced immediately. Use panel can seal the hole or damage. The screen must be replaced as soon as possible. Before replacing, you should do the plan earlier for reducing time of stop drilling, and prepare tools and screen. When the drilling fluid is not circulating, the user should clean up the big drilling cuttings in the drilling fluid reserve tank. The centrifugal separation is aimed at separating solid from drilling fluid, or separate two kinds of miscible liquids which are incompatible and different density. When using centrifuge to separate drilling fluid solid phase, drilling fluid enter into drum from high-speed revolution auger conveyor hollow shaft, under the high-speed revolution of drum and conveyer, solid particles move to drum wall, and sink to drum wall of centrifuge, little particles and liquid phase in nexine. The area between the drum inwall and auger stripper ektexine is called depression area. Separated drilling fluid flow out from drum big end overfall. The vanes of auger conveyor push sedimentary particles to dehydration area, at last expel from drum small end. Drilling fluid centrifuge can be classified three types: low speed centrifuge, intermediate speed centrifuge, high-speed centrifuge. 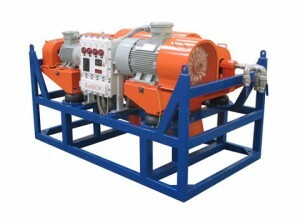 The low speed centrifuge mainly used for recycling barite and other weighted solid phase particles from drilling fluid, so that control drilling fluid density, the economic benefit for using the method of dilute drilling fluid to control drilling fluid density is very obvious. Moreover compared with middle or low speed centrifuge, the thruput of high speed centrifuge is less about five times, and can deal with the solid particles which relatively fine, it is a problem to separate drilling fluid which contains higher solid phase density, so the high speed centrifuge and the low speed centrifuge must be used together. Separation factor of Intermediate speed centrifuge is 700~1200, range of speeds is general 1800~2200r/min, separation point is 5~7um. Mainly use for eliminating harmful solid phase from drilling fluid, control the density and viscosity of drilling fluid. This is the most widely used centrifuge in drilling crew. General separation factor is about 800. The installation site of centrifuge should be convenient for discharging base flow and recycling overflow. About the current level drilling fluid solid control system, the storage tank of desilter and mud cleaner treating fluid can be acted as the suction tank of centrifuge, and the storage tank which recycling overflow must have agitator. 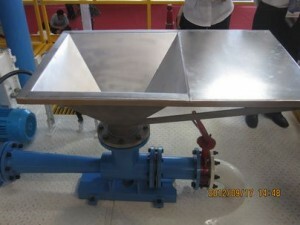 When using the centrifuge to recycle the barite of weighted drilling fluid, the separated base flow should be reinjected to the drilling fluid recycle system, because of the base flow contains little liquid and is difficult of flowing, it is hard to mix with drilling fluid, so the effect of agitator is very important, in other words, the mud tank which recycling barite base flow must has stirring apparatus. If the separated base flow will be discarded after throughing chute, the angle of inclination of chute is 42°at least, and convenient for flowing of the waste. Before the solid control system leave factory, all of them should be installed and debugged in factory. Because the installation of solid control system is related to future drilling fluid solid control system whether can work normally and the service life of solid control equipments, so we must complete installation work strictly. 8 Install the solid control equipments. After installation must carry on the overall check, after passed examination can do the solid control system debugging. The equipments which needed to debug including shale shaker, vacuum degasser, mud cleaner, centrifuge, shear pump, sand pump, centrifuge feed liquid pump, drilling mud gun and mud agitator. With the development of well drilling technology, drilling fluid solid control system plays an important role in drilling operation, various kinds of solid control systems emerged at the right moment, no matter how to change the type of solid control system, it’s basic function will not changed. It is depend on organic combination of mechanical removal equipment, drilling fluid storage tanks and other auxiliary equipments to accomplish the basic function. 1 Drilling fluid trough system in tank, between each adjacent tank have drilling fluid trough to connect, every bin in each drilling fluid tank are installed a set of drilling fluid board, can control the drilling fluid direction expediently and quickly at any time. 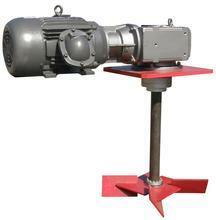 2 Drilling pumps suction system, drilling pumps are used for delivering drilling fluid. The suction pipelines of pumps are composed of pipeline in tank, valve and connection, can through the change valve to realize drilling pump natural suction. 3 Weighting system, the weighting process is composed of weighting pump, weighting funnel and relevant pipeline, valve. 4 Shear system, shear process is composed of one shear pump, one shear funnel, a set of shear gun and matching pipeline, valve and connection. Can meet the preparation and transportation of medicine. In addition, solids control system is also including drilling mud gun pipeline system, clear water pipeline system, tank bottom connection pipeline system, etc. All parts which make the rotary motion, such as gear, mixer, etc, all of them must be installed in the shaft, for delivering motion and power. So shaft is one of the main parts of the machine. The choice of drilling mud agitator mixer shaft material, from stress and working conditions to make it safe, suitable, easy to manufacture and economic. The material of shaft should have enough strength, stiffness and toughness. In addition, in order to easy to manufacture, we also need to have excellent cutting processing skill, so that we usually use number 45 high-quality steel. For the low requirement mixer shaft, also can use Q235-A or number 35 steel. In the actual use, the most common dynamic seal have two kinds: packing seal and mechanical seal. Drilling mud agitator shaft belongs to low speed, low pressure, applicable is packing seal, the packing seal has the advantage of simple structure, easy to maintain and high reliability. For adapt to requirement of agitator in different cases, the category of gland packing material are many. Which kind of material to choose mainly according to the mixer shaft spindle speed, operating temperature, operating pressure and chemical property of material. 1 Should be resistant to the soaking and corrosion of medium and lubricant, and does not contain the material which can be swelled and weakened by medium and lubricant. 2 Should have enough flexibility, to absorb the design which can’t avoid shaft moving. 3 Under the situation of gland pressure is too tight, it still has running freely, will not produce destructive friction and heat performance. 4 Should have enough plasticity, under the packing gland compression can be adapt to the shape of shaft and seasoning function and for deformation. 5 Won’t bite or corrosion shaft. 6 Wear slow, rarely need to adjust and change. Usually the materials used to make gland packing have fiber, metal and lubricant, etc. User can according to the specific work to choose. Drilling mud agitator reliable seal is an important thing. The oil leak caused by mud agitator seal, not only waste oil largely, but also pollute drilling fluid. Because of mixer shaft is the rotary motion, so its seal belong to dynamic seal. 3 Seal service life should be long. The following picture is the drilling mud agitator packing seal structure, it is composed of 1-bushing, 2-packing box, 3-O ring, 4-water leg, 5-packing ring, 6-gland, 7-holding down bolt, etc. 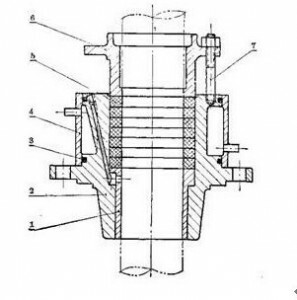 About packing seal principle can do such description: the padding filled into annular gap between mixer shaft and stuffing box, under the effect of gland force, produce radial compression force to the mixer shaft surface. Because of the packing contains lubricant, so there will produce a layer of thin liquid film when produce radial compression force to the mixer shaft surface. The layer of liquid film on the one hand make mixing shaft get lubrication, on the other hand avoid to leak liquid or exterior liquid permeate. This is the principle of the packing seal. Although added some lubricant when manufacture padding, but the quantity is limited, because the lubricant still be consumed constantly, so only rely on the padding itself lubricant is not enough, so we should also add a lubricant device on the gland box, to meet the need of continuous lubrication. Welcome to my blog if you want to know more. As with all equipments, jet mud mixer and associated equipment must be correctly chosen, calibrated and installed, to obtain the ideal working performance. Need to satisfy the require of proportioning at scene. 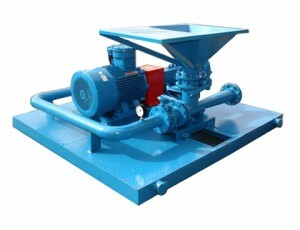 General requirements mixing hopper capacity shall not be less than 150m3/h. For the larger tank and great pump motor power, we can also use the mixing hopper with 300m3/h capacity. Try to reduce pipeline on-way resistance, thus the pipeline required short and thick, smooth bend. Jet hopper equipped with matching venture tube can improve treating capacity, speed up solid diffusion and avoid caking. Strengthening the repair and maintenance, in most cases, the back pressure shall not be greater than 20% of the input pressure. Another important consideration of install equipment is the drilling fluid required lifted height. If discharge needed to enter into different deck tank or a taunt tank and hopper, mix rate will be decreased. When the height from 1.83m to 3.66m, barite adding rate will be reduced to 17%. 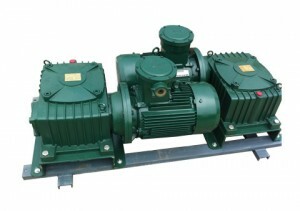 If the increased demand is very high, the pump capacity is insufficient, mixed ability will be greatly reduced. From the preceding discussion show, jet mud mixer can work effectively, but the jet mud mixer unreasonable installation will cause a lot of problems. If we can choose, install and debug charging system correctly, the work load of whole system maintenance will be reduced, the drilling fluid cost will be decreased, the working hours of treating drilling fluid also will be reduced. Jet mud mixer is used to make up drilling fluid or increase total amount of the drilling fluid, change the fluid density, viscosity, and dehydration. When making up again, put the materials of drilling fluid (such as betonies and barite powder) and corresponding chemical additives (such as polymer) into the recycle tank through the jet unit. If put them directly, the materials of drilling fluid and chemical additives will be deposited largely or dump together and we can’t obtain diffused and well-proportioned drilling fluid. Jet mud mixer device generally consists of a sand pump and a jet flow mixed funnel with manifold valve connection and are installed in a pedestal called the single jet mud mixer device, or by two pumps and two mix slurry funnels called double jet mud mixer device. The gap between nozzle and venturi tube must be suitable, when reach optimum efficiency, the gap is 32~90mm, usually don’t more than 90 mm, otherwise the feed speed of barite will be significantly reduced. Mixed hopper hydraulic linear loss should be tried to reduce, otherwise the treating capacity may be decreased greatly. The return pressure of outlet pipe needed moderate, overlarge return pressure will reduce the treating capacity of mixed hopper. The higher inlet pressure is, and the larger treating capacity of mixed hopper is. The taller installation of mixed hopper is, the higher return pressure is, mixed capacity will be reduced. For example, if mounting height from 1.8 m to 3.66 m, treating capacity will fall by 17%. Drilling mud mixer is a kind of equipment which matching with petroleum drilling solids control system, using it to satisfy drilling fluid of weighting and preparation. So that we must ensure the performance of mud mixer is good. 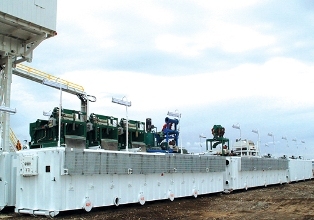 The reasons of shale shaker loss fluid: the content of solid phase in drilling fluid is large, viscosity is high, drilling cuttings is disperse; shale shaker vibratory force is little, sieve mesh number is large, screen area is little; the direction and location of shale shaker liquid inlet port is inappropriate when install in scene. Now from the following several aspects to carry on the analysis. Quick drilling of surface layer will generate a large number of solid phases, occupy effective screen area, so we can’t use fine mesh screen on shallow shaft segment. The medicine added in drilling fluid fail to dissolved fully, paste on the screen. We should wait for the medicine dissolved fully. Drill to loose including sandstone layer or flow sand layer, the sand is easy to block in screen hold, and cause screen blocking phenomenon. Therefore we should test several different mesh screens to reduce screen blocking phenomenon. The shale shaker with crochet screen structure, the two sides screen surface is lower than the middle, drilling fluid is easy to flow to two sides and loss, therefore drilling fluid should be ensured flow into the screen box from the middle. 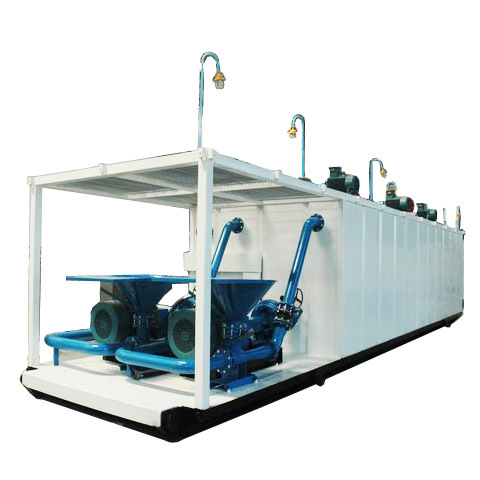 Each shale shaker handling capacity is 50m3/h, generally larger than the discharge capacity of drilling pump, but will still loss liquid in actual use. This is because the handling capacity test condition is according to the provisions of the national standard: choose 60 mesh number screen, and use weighted drilling fluid to test, drilling fluid contains different particle size of sand. While in actual drilling, the drilling fluid is complicated, maybe require to use 200 mesh number screen, more than four shale shakers will be needed to dispose the whole drilling fluid.